If you liked the tour's history, just come to Hamlet Badut, Karangwidodo village, Malang. 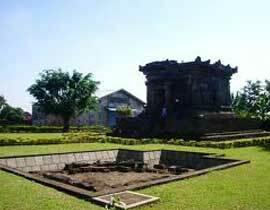 There are temples Badut, one of the existing temple diKabupaten Malang as evidence of past glory. To get to the location is very easy because the microbus (public transportation) from the terminal Arjosari majors Tidar hung nearby, not far from housing Badut Permai. Badut temple discovered by accident in 1921. The first person who reported the existence of the temple is a serving controller Maurenbrecher BB (Civil service in the colonial period) in Malang. When the temple was closed Badut bushy plants. Excavations and investigations started in 1925 and ended in 1926 with back coaching efforts. In his native state of Badut Temple surrounded by a concrete wall and three small chapel on the front that everything is lost, only the former base. In addition there is a statue that according to the custom layout that is north of the temple of Durga Mahisasuramarni, Ganeca east, south Ciwa Teacher, Nandicwara Kala, and Ling. What is here is currently living statues of Durga and Ciwa Guru, while another statue was gone. In the main room there is the yoni. Badut temple roof can not be rebuilt because many stones are missing. There are specific signs that indicate that this temple is one of the oldest temples in Java with a decoration in temples Badut form when makara decoration on the gate. His style is similar to the temples in Central Java, decoration when not using the lower jaw, is different as is generally found on the temple in East Java. Kinnaras and Kinnari decoration on the temple stairs, in the form of a human head shaped ornament bodied birds. Flower decoration on the temple walls are similar to the temple Sewu Kalasan and temples in Central Java. There is no relief or other decoration on the temple walls of the temple tells about the Badut. Judging from the style of the temple there are similarities between the style of temple building in Java Temgah especially with the Dieng temple complex. One, between the main room of the temple and the face are connected by long covered porch. Two, large-sized master bedroom wall and 3.67m 3:53 (temple in East Java has a smaller size). Three, there is a symmetrical arrangement of the floor plan of the temple in accordance with the temple in Central Java. Four, the composition of the base of the temple Badut simple shape and height. There is one thing that is still being debated because there is no clear evidence. In the eighth century there was a kingdom named Kanjuruhan whose center around Malang and stand on its own. Wise king named Devasimha who has a son named Gajayana. Gajayana have a daughter named Uttijana. King Gajayana create a temple for the Maharsi (Agatsya) are respected and revered in the form of sculpture that was placed in a temple (probably temple Badut now). One thing that diakai for connecting temples to the royal Kanjuruhan Badut is Badut. According to the inscription Dinoyo, King Gajayana also named Liswa in Sanskrit means a badut (pelawak_. Privileges Dinoyo inscriptions written in Sanskrit or ancient Java, no longer letters and numbers Pallawa year Condra Sangkala arranged in the form of which reads: Nayana Vasurasa = 628 saka = 760M . Inscription is the biggest role in the historical source of a great empire that ever existed in Kanjuruhan Nalang Badut besides temples, temple Besuki (only a base and a statue Agtsya, situated near the temple Badut), and the discovery of local statues. Well for you who likes to surround the history you must visit this place to broaden the history of the past.